Black Diamond lightweight trekking pole with built-in shock absorbing technology. 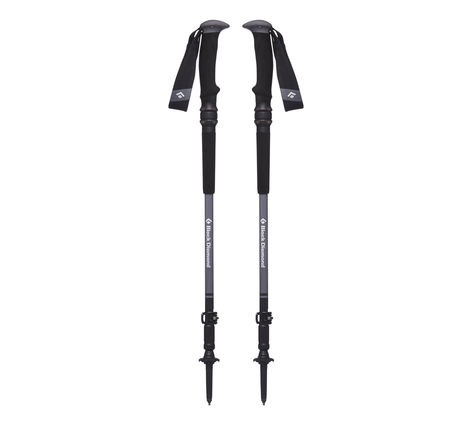 Black Diamond trail series trekking pole designed for four-season on-trail versatility, the Trail Pro Shock features the terrain-absorbing benefits of the Control Shock Technology, combined with the quick deployment and collapsibility of Black Diamond new SmashLock quick-release technology. The SmashLock quick-release mechanism allows you to quickly deploy the telescoping pole and lock it into place with an easy-to-hear click (keep the FlickLock Pro closed during deployment). Then, with the FlickLock Pro open, swiftly and firmly press the tip of the pole into the trail to release the SmashLock for a quick collapse. The redesigned FlickLock Pro adjustability is now lighter, stronger, and easier to use, while featuring a forged aluminium construction. Interchangeable carbide tech tips offer secure bite on every surface. SmashLock quick Release technology for quick deployment and collapsibility. New FlickLock Pro adjustability—now featuring aluminium construction that’s lighter and easier to use. Updated soft-foam grip with solution strap for added security and better handling. Usable length: 1-5 - 140 cm.